TORONTO, Sept. 28, 2017 /CNW/ - As your biggest financial investment, house hunting should be a rational, logic-driven process. 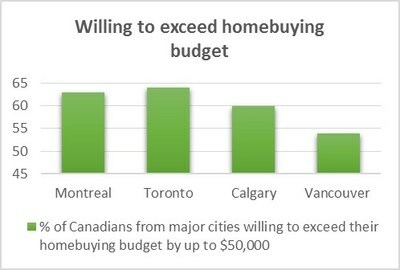 In reality though, buying a house is often an emotional rollercoaster that leads many Canadians to spend more than they can afford – leaving them in financial hot water. 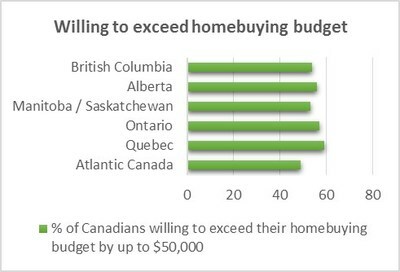 A new TD home buying survey reveals that even though some markets across the country are cooling, 60 per cent of respondents would be willing to exceed their budget, with more than half (56 per cent) saying they would go over their budget by up to $50,000. "Emotions are playing too big of a role in the home buying process and are tempting buyers to spend more than they can afford," says Roy D'Souza, Associate Vice President, Real Estate Secured Lending at TD Canada Trust. "$50,000 might lose its sticker-shock compared to the overall price of a house, but it's still a substantial amount of money that could be used to meet other financial needs. Whether you're moving into your first home or upsizing to something bigger, keeping your feelings in check is critical to making objective decisions that match your short- and long-term financial plans." TD's survey also shows that Canadians are financially overconfident when it comes to purchasing a home. More than half of homebuyers (57 per cent) say they are confident about what they can afford, yet 97 per cent of homeowners admit they wished they had factored in their other financial obligations when determining how much mortgage they could really afford – including property taxes and home maintenance costs (54 per cent), and overall lifestyle expenses (33 per cent). "How you live is just as important as where you live," says D'Souza. "Owning a home is a lot more expensive than buyers expect. Buyers who don't account for these extra costs are potentially putting themselves under a lot of financial stress should their circumstances unexpectedly change, and are also risking not having enough money left over to maintain their lifestyle, and continue saving for the future." To help inject needed financial reality into the home buying process, TD offers its online Mortgage Affordability Calculator, which uses financial information provided by the potential buyer to help them understand how much home they may be able to afford after monthly expenses, debt payments and savings are accounted for. The Calculator offers a high, medium and low range of affordability options to assist buyers in finding a home that may comfortably fit their budget and lifestyle. It also links to active real estate listings that match the user's budget and desired neighbourhood from REALTOR.ca and connects them to expert REALTORS®. "More than a third of homeowners told us they want to calculate their mortgage range themselves – making this tool ideal for potential buyers doing research on their own; helping them assess their financial situation with more accuracy and make better financial decisions for the long-term. Our Calculator frames home searches within realistic parameters by giving homebuyers a high and low benchmark for their budget, and providing real life examples of what home buyers can afford through REALTOR.ca listings," says D'Souza. Build a buffer before you buy: More than half of those surveyed (58 per cent) say they're worried that a rise in interest rates will affect their ability to afford a home, while 43 per cent worry about job stability and other personal issues. As much as possible, consider and plan for the unexpected by maintaining a financial buffer of at least three to six months, to help offset the impact of unforeseeable rate changes. Also take the time to learn as much as possible about the best type of mortgage to suit your needs (for example, fixed versus variable interest rates) to ensure you're making an informed decision that works best for you. Be honest about your lifestyle: Don't confuse your budget with the mortgage you qualify for. Consider what your priorities are and get honest about what can you live with, what you can live without, and how your mortgage payments and ongoing home costs will impact your quality of life. Smart prioritizing will reduce the number of financial sacrifices you'll need to make. Embrace a homeowner state of mind: If you're currently renting or living at home, you might not have fully considered the expenses that come with home ownership beyond mortgage payments. From maintenance costs to various types of insurance needs, there are different expenses to factor in when determining how much you can afford. A good idea is to test drive your mortgage by putting aside what you anticipate your mortgage payments and home owning costs will be each month to prove that your budget is sustainable.